A perennial plant. Rhizome thick, spindle-shaped, short, in its upper part stiff. Stems erect or at the base upward, 40.0 - 60.0 (70.0) cm tall, bare or sparsely-fitting fibrous, stipule lancet in the lower part and jagged to shared, usually fibrous, shorter than petiole or equal to it. Leaflets back ovoid, to almost linear or oval, at the bottom fitting fibrous, top with rare hairs or naked. Clusters with 5 - 40 flowers, ovate, ovate cylindrical, elongated after overblown, loose or compacted. Inflorescence stems short, thick, with beans faced, bare or hairy. Bracts equal to flower stems or longer, threadlike to Lance, membranous. The flower stems bare, simple or glandular fibrous, equal to calyx or shorter. Flowers 6.0 - 11.0 mm long. Calyx amounted to 1/3 of the corolla, fitting fiber; lanceolate teeth, equal to the length of the tube or slightly longer. Corolla blue dove or variegated (yellow, and blue). A flag oval back or ovoid, 3.0 - 4.0 mm wide, equal to the keel and wings. Beans about 4.0 - 5.0 mm in diameter, spirally wrapped with 2 - 3.5 turns, in the middle without opening, brown to gray, naked, smooth, with anastomosed lateral veins. Seeds 2.0 - 2.5 mm long, more or less kidney, yellow or brown. Widely cultivated in the lowlands of the country fodder plant. Economic importance. Excellent fodder plant widespread in the culture. It gives a very good high protein content feed table. In Bulgaria often suffers from drought. Note. Kind of hybrid origin, described on plants in France and Spain. (Vasilychenko, 1. pp.). The typical form (in wild condition is unknown. Part of numerous cultural races are wild. In Bulgaria cultivate hybrid forms introduced by France, Italy and Germany. They show great variability that is difficult to capture without experimental research. 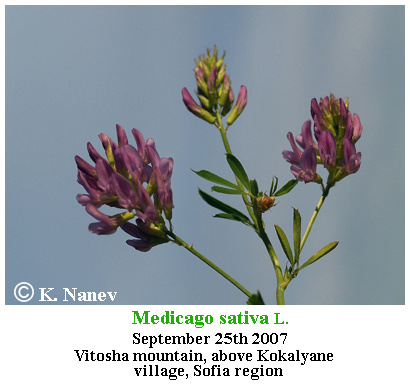 In Western and partly in northeastern Bulgaria observed typical transitional types between M. sativa and M. falcata, whose transience expressed of spectacular and significantly low in the lower half less-leafy stems. They can be assigned to artificial species hybrid nature (M. varia Mart., M. subfalcata Schur, M. sylvestris Fries., M. spuria Hy., M. polya (Brand.) Vass., etc.). 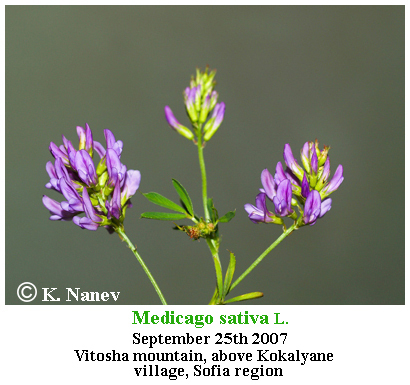 Their development in Bulgaria (mainly in field borders and abandoned and degraded, rarely less affected by human land) due to the constant possibility of natural hybridization processes between M. falcata and M. sativa. 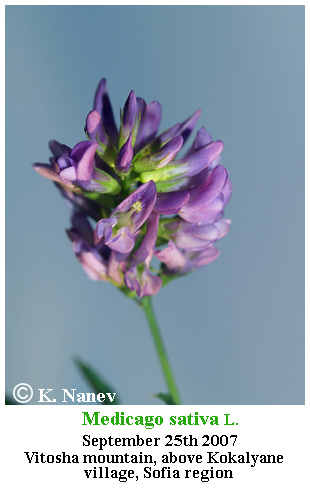 Some of these natural hybrids are a good source of material selection creating drought-resistant varieties of alfalfa. 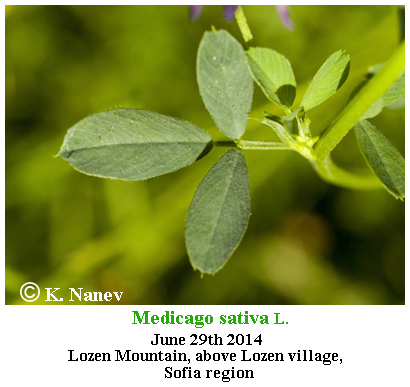 Alfalfa /ælˈfælfə/, Medicago sativa, also called lucerne, is a perennial flowering plant in the pea family Fabaceae cultivated as an important forage crop in many countries around the world. It is used for grazing, hay, and silage. The name alfalfa is used in North America. The name lucerne is the more commonly used name in the United Kingdom, South Africa, Australia, and New Zealand. 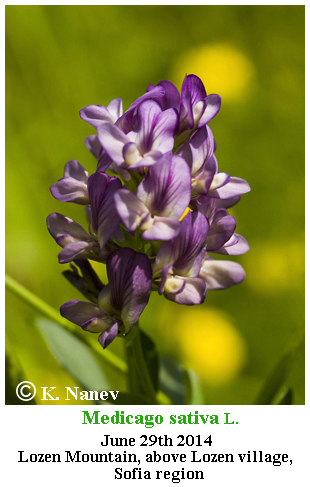 It superficially resembles clover, with clusters of small purple flowers followed by fruits spiralled in 2 to 3 turns containing 10–20 seeds. 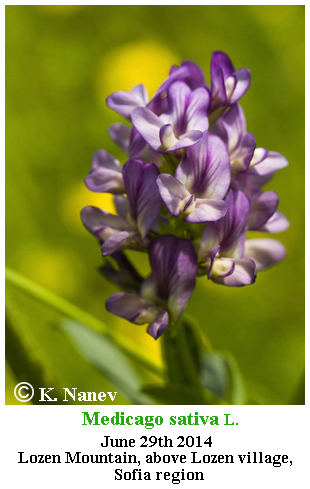 Alfalfa is native to warmer temperate climates. It has been cultivated as livestock fodder since at least the era of the ancient Greeks and Romans. 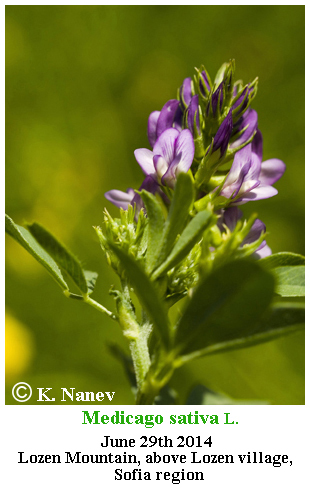 Alfalfa is a perennial forage legume which normally lives four to eight years, but can live more than 20 years, depending on variety and climate. The plant grows to a height of up to 1 m (3.3 ft), and has a deep root system, sometimes stretching more than 15 m (49 ft). This makes it very resilient, especially to droughts. It has a tetraploid genome. Alfalfa is a small-seeded crop, and has a slowly growing seedling, but after several months of establishment, forms a tough "crown" at the top of the root system. This crown contains many shoot buds that enable alfalfa to regrow many times after being grazed or harvested. 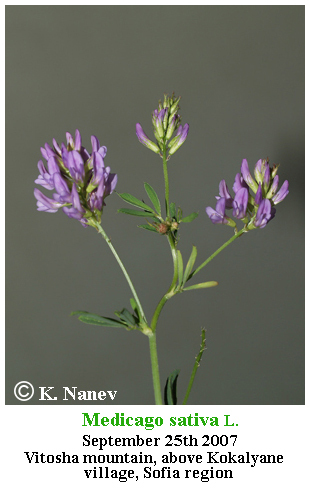 Alfalfa can be sown in spring or fall, and does best on well-drained soils with a neutral pH of 6.8 – 7.5. 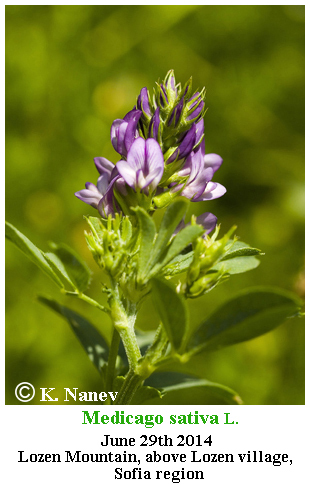 Alfalfa requires sustained levels of potassium and phosphorus to grow well. It is moderately sensitive to salt levels in both the soil and irrigation water, although it continues to be grown in the arid southwestern United States, where salinity is an emerging issue. Soils low in fertility should be fertilized with manure or a chemical fertilizer, but correction of pH is particularly important. Usually a seeding rate of 13 – 20 kg/hectare (12 – 25 lb/acre) is recommended, with differences based upon region, soil type, and seeding method. A nurse crop is sometimes used, particularly for spring plantings, to reduce weed problems and soil erosion, but can lead to competition for light, water, and nutrients. In most climates, alfalfa is cut three to four times a year, but it can be harvested up to 12 times per year in Arizona and southern California. Total yields are typically around eight tonnes per hectare (four short tons per acre) in temperate environments, but yields have been recorded up to 20 t/ha (16 ts per acre). Yields vary with region, weather, and the crop's stage of maturity when cut. Later cuttings improve yield, but with reduced nutritional content. 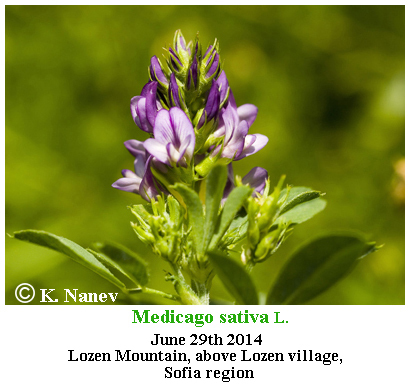 Distribution in Bulgaria: Widely cultivated in the lowlands of the country fodder plant. 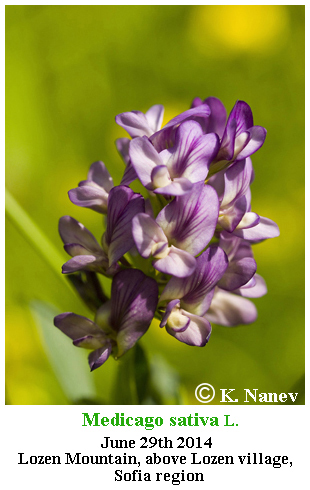 (Conspectus of the Bulgarian Vascular Flora) = conspectus&gs_l= Zlc. Distribution: Originated in Central Asia. Introduced as a forage plant first in Southern Europe, subsequently transferred to almost all corners of the world.